Mongols invade Japan - After Kublai Khan became emperor of China and founded the Yuan Dynasty, he turned his attention east to Japan. Most of Asia had been conquered by the Mongols and was already under the control of one Khan or another. But Japan, as a series of offshore islands, remained beyond their reach. Kublai sought to change that. As the grandson of Genghis Khan, conquest was in his blood. Since the first humans migrated there, Japan had never successfully been invaded by a foreign power. (In truth, the history of Japan goes back much further than is depicted on this chart, just as does the history of Russia. Because of space limitations, however, I started them both at specific points in history). But this was the Mongol Empire; rarely had it known defeat Kublai Khan invaded Japan twice, in 1274 and in 1281. Friction began in 1266 when Khan sent emissaries to the island to demand submission and tribute. They returned empty handed. He tried again in 1268, going directly to Japan's ruler, Shikken Hōjō Tokimune (shikken can be translated as "regent", Japan did not yet have an emperor at that time). The second attempt met with the same result. Sources say that Khan was outraged and wanted to invade Japan immediately. But the Mongols had been exclusively a land force and lacked the fleet necessary to do it. Over the next five years he used China's resources to build a navy that could ferry an army across the water. In the interim, he had sent ambassadors four more times, but officials refused to even allow them to set foot on Japanese soil. By September 1274, the Mongol/Chinese fleet was ready to launch. It consisted of about 750 ships, 300 large vessels and various smaller support ones. They were filled with about 15,000 Mongol and Chinese warriors and about 8,000 Koreans (Korea was a vassal state of the Yuan at this time). The fleet landed in Hakata Bay on the southern island of Kyūshū on November 19 (it took that long to get there because the army pillaged several smaller islands along the way). The Japanese were ill-prepared for the invasion. A small force was charged with holding off the Mongols until reinforcements arrived. The Japanese had not been involved in a major conflict in over a half-century and were quite inexperienced. The Mongols on the other hand were battle hardened from almost constant warfare on the mainland. On landing, they easily beat back the defending force. However, nature would intervene and play a decisive role. By nightfall a storm approached and began battering the ships. The Mongols decided to re-embark and anchor off the coast until the storm passed for fear they might be stranded on Japanese soil. Only a handful of a ships remained docked. The storm turned out to be a typhoon. It destroyed about 200 ships and damaged many others. Meanwhile Samurai warriors arrived to reinforce the Japanese defenders. They boarded the surviving ships and fought the Mongols at close quarters. This played to their advantage since the Mongols were accustomed to fighting in the open field on horseback. Except for the fact that their swords were not designed to deal with Mongol armor, the Samurai managed to repel the invaders. It became known as the Battle of Hakata Bay (now the First Battle of Hakata Bay due to the second invasion seven years later). Those who were not sent to the bottom of the sea by the storm or killed by the Samurai retreated back to China. The poor design of the Japanese swords led to the development of the Katana, a shorter stronger blade than the one that had been used. The first Mongol invasion had been repelled. The Japanese were expecting a second. They built up their defenses by constructing forts and erecting walls along the coast. For his part, Kublai Khan was determined to force Japan's hand diplomatically. A year after the invasion, he sent five emissaries with orders to stay until they received a response. Tokimune's response was to behead them. Khan tried one more time in 1279 with five more emissaries. They too were beheaded. Clearly diplomacy was not working. So in 1281, Khan assembled a massive fleet which dwarfed the first one. It launched in two waves. 900 ships carrying 40,000 soldiers from Korea, and 3,500 ships with 100,000 from China. Khan's goal was to overwhelm Japan's defenses. However, the Chinese fleet was so large, it had to be delayed while it was being supplied. As a result, the two navies could not coordinate their attack. The smaller Korean navy arrived in June, landing once again at Hakata Bay. Japan managed to raise an army of 40,000 Samaurai, and combined with its newly built defenses, prevented the invasion force from penetrating inland. The allied army (Mongol, Chinese and Korean) suffered heavy losses. By the time the Chinese fleet arrived in August, the initial force had been severely depleted. Still, with the addition of 100,000 new troops, Japan's defeat seemed almost certain. 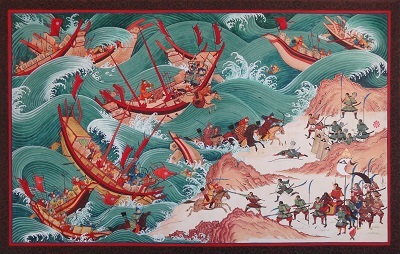 The Samurai fought admirably against superior numbers at the Second Battle of Hakata Bay and held off the Mongols the first day. On the night of August 15th, fate once again intervened. A second typhoon, even more powerful than the first came ashore and rocked the Mongol ships. They withdrew off the coast in an attempt to keep them being smashed on the beach. But the storm was so powerful, most of the ships were broken up at sea. Only a few thousand allied soldiers made it back to shore alive, but were quickly hunted down by Japanese warriors. Out of the 140,000 troops which invaded Japan, less than a thousand made it back to the Asian mainland alive. Part of the disaster is blamed on the hastily assembled navy, which relied heavily on shallow-hauled ships designed for river navigation, not ocean sailing. The Japanese refer to the two storms which saved their land from invasion as Kamikaze, which means "divine wind". It was a word made famous at the end of World War II when Japanese pilots, known as Kamikazis, flew their planes into American ships.